I mentioned last week I was working on a giveaway... What do you think? 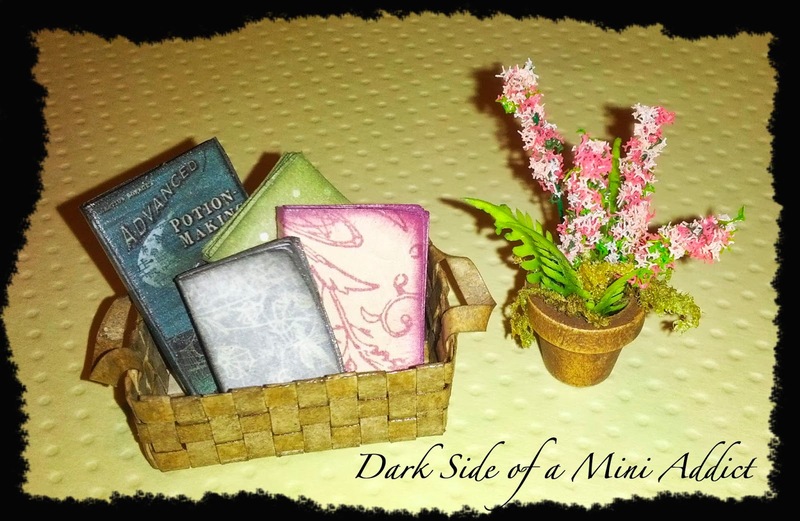 3 notebooks, basket with handles, potted plant with flowers and because I have to add a little dark to my minis I added a potion from one of my favorite schools. It was all made/put together by me. The books in the basket are not glued down so you can move them around and place them wherever you want and the basket is made from weaved paper. This giveaway is open to my current 62 followers. To enter please let me know in this post. I'll draw the winners name on Wednesday and hope to mail out the package this weekend. Good luck everyone and thanks for following me! I love the notebooks and basket and the flowers look so real! Holy wang dang doodle that's some gorgeous stuff!!!! Yes I have and I like the idea of the crazy cat lady house! When I was a kid I remember this lady who lived in the house behind us and I would help her out with chores. Omg she must have fed every cat in the neighborhood! It was crazy fun at here place and she was a super nice lady. Plus for payment of the chores I did for her (because she would not take no for an answer as to paying me) I would take my payments as having lunch with her. I spent many Saturdays eating fried eggs or egg sandwiches with her and those many cats. Ohh and her two little dogs. Hehe thanks lady, consider yourself entered. I hope the lucky winner likes them. A lovely giveaway. Please count me in. I'll put your link on my blog. I want to participate in the raffle. Already, I appreciate the opportunity. Cool, count me in. I'll put it up on my blog sidebar. I would love to join your giveaway. So please count me in. Books, flowers and basket, it's all so wonderful. Hola Jane. Yo soy tu seguidora pero no tengo blog. No se si pueda participar, pero me gustaría mucho. Me encantaria participar, son unos preciosos regalos. Dime si subo el anuncio a mi blog. I'd love to enter your lovely draw - so I hope you'll count me in. This is a wonderful give away. I would love to participate, so please, count me in. I'll put the link on my blog. Good luck to everyone :D!! Beautiful giveaway I love the flowers. Please count me in. I put the link on my sidebar. Drum Roll Please. .. .. . . .